It’s Friday, which can only mean we’re back on the blog with more news on Burnout Paradise content for 2009. Today, we’re announcing the incredible new Carson Extreme Hotrod. 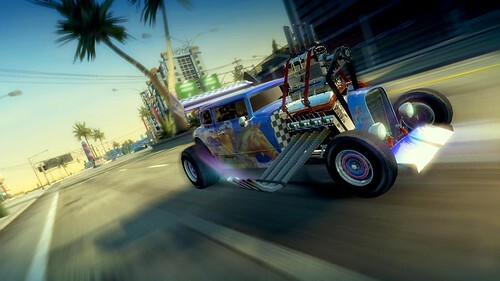 If you caught our recent announcements, you’ll know we’re bringing more content to Burnout Paradise through 2009. We’ve talked Party, Ultimate, Legendary Cars and Toys in recent weeks. Now we’re mixing things up with a little boost-based gameplay innovation with the Extreme Hotrod. We’ll be back in the New Year with all the details on this powerhouse racer, but for now we’re keeping it under wraps. We could tell you that it’s the fastest car in Paradise City – a stripped down, ultra low, overpowered straight line monster. We could talk about its roots in American Rat Rod culture and it’s wildly exaggerated Hot Rod features, based on a ‘20s Roadster. We could explain that we’ve rewired Burnout’s vehicle dynamics system, so it handles more intuitively and drifts more realistically than any other car. We could reveal that it’s the first of a pack of 2 cars designed to re-imagine Burnout Boost. Which explains the blue exhaust flames. We could do all that, but we don’t want to give away too much. For now, all you really need to know is that this car will give you the ride of your life and in early 2009 you will NEED to own it. The Carson Extreme Hotrod. Light the touch paper and hang on for dear life. We’ll be back with movies, screens, more info and interviews with the creators on this and the “other” boost car that will be available to buy as part of our Burnout Paradise Boost Specials Pack in 2009. Just check back here on the blog, www.criteriongames.com or Crash TV for all the latest. Next week. Big Surf. See you then. This blog always has such nice pretty pictures. 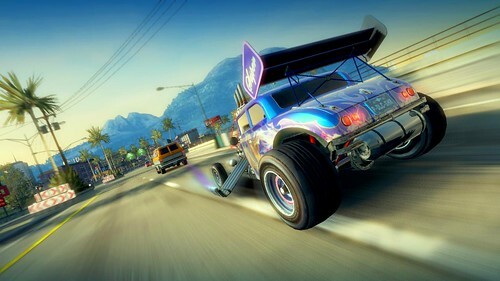 Do you guys think you’ll make a second burnout paradise game or just keep adding stuff to the original? This is why I’m getting Burnout on PSN with Street Fighter 2. Not only free content upgrades, but the devs are really having fun with this game and I just hae to be a part of it. Why get the rip off that is NFS when we got this:D.
Every PS3 and 360 on the planet should just come with Burnout. Im surprised that not all games get this amount of online support by the devs. I mean Dead Space is okay but not really anything revolutionary – just some skins. Warhawk aswell, is great. You guys are have lifted the bar for add on content, thank you. Do you think that Burnout will ever be given a photomode? Just from seeing the screenshots of the new car (which looks fantastic!) I thought that a simple “Capture Your Online Madness” thing would be great. Do you think this could ever be a possibility? Thank again Criterion for bringing us the best Developer support we could ever want. Anyone who is still thinking about getting this game, stop thinking and just buy it! Why not add 4 player split screen to this game already, u ppl are missing out on sales around my hood as we dont care about online gaming. If i’m correct but u did added custom soundtracks which was HUGE. Hey I’ve gotta say thanks for keeping the content for this game rolling. You guys are doing a great job and the game is a lot of fun. one thing i kinda want to ask for though is maybe an in game music player that can take music either from the hard drive or from media servers over the network. I only ask cause, I’ve got no idea when the xmb will support it, and i love to listen to music while driving around. And no offense to the guys that chose the music for the soundtrack, but it really just isn’t doing it for me. Oh, wait, i guess according to #64 you added custom soundtracks. sweet. thanks guys.